Carson Warner (L) and Michael Jenkins won first place in the sumo competition at Thursday's Robot Rumble. Warner and Jenkins said adding claws to the front of their machine was key to securing the victory. If you’d only seen their faces, or their pumping fists, or the way some bounced from foot to foot, you might have guessed the dozens of kids gathered at Polk State Lakeland on Thursday were watching the final seconds of the Super Bowl or the World Cup, or maybe the opening number of a Justin Bieber concert. 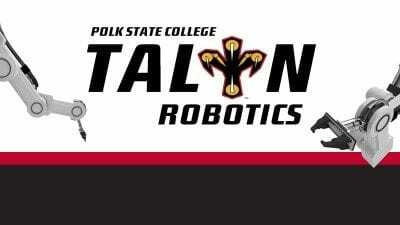 Instead, all that excitement was for the Robot Rumble, the final competition of Polk State’s annual TALON Robotics program. TALON Robotics began in 2012. 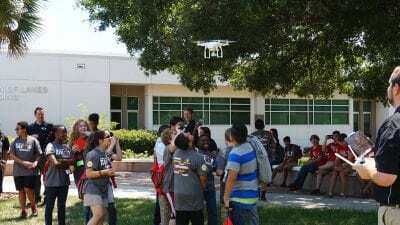 For about two weeks, middle- and high-school students build and experiment with robots, and visit businesses that use robotics in their operations; there is also a digital media component of TALON for high school students. Participants get STEM education, lots of experience in problem solving and collaboration and, judging by Thursday’s event, plenty of fun, too. TALON’s end-of-session competition is the culmination of all the kids have learned throughout the program. After days of building, programming and refining their robots, students pit their machines against one another for various challenges — like “Green City” in which students program their robots to perform jobs, such as starting a miniature wind turbine, and sumo wrestling, in which students program their machines to battle it out in the ring. About 80 students from 40 different schools all across Polk County participated in this year’s edition of TALON. Among those was Carson Warner, who is heading into the eighth grade at Jewett Middle Academy Magnet in Winter Haven. Warner participated in last year’s TALON and returned this year, he said, to take care of unfinished business — winning the Robot Rumble. After multiple rounds on the sumo mat Thursday, Warner reached that goal, when he and teammate Michael Jenkins, an eighth-grader at Davenport School of the Arts, won the event with their robot, named Morgan Freeman. Warner and Jenkins equipped their machine with two sets of claws to hook and topple the competition. The claws were added to Morgan Freeman, the teammates said, after much analysis and experimentation. “The claws slide under the outer walls of other robots,” Jenkins explained. Warner said in addition to finally attaining the victory that had eluded him a year ago, he also got his first real taste of competition — and he loved it. “This was the first time I really competed against others. It makes you better and it makes you want to learn,” he said. Byer’s mom, Kim, said she’d seen new enthusiasm in Bryce during the course of TALON. Some of that enthusiasm was on display on Thursday, as Bryce reacted with obvious emotion to capturing first place. “He’s very interested in robotics. He’s been very excited and impressed with his teachers. He’s come home wanting to learn more,” said Kim Byer, before heading to the stage of the Lakeland Technology Building to see Bryce receive his first-place certificate. 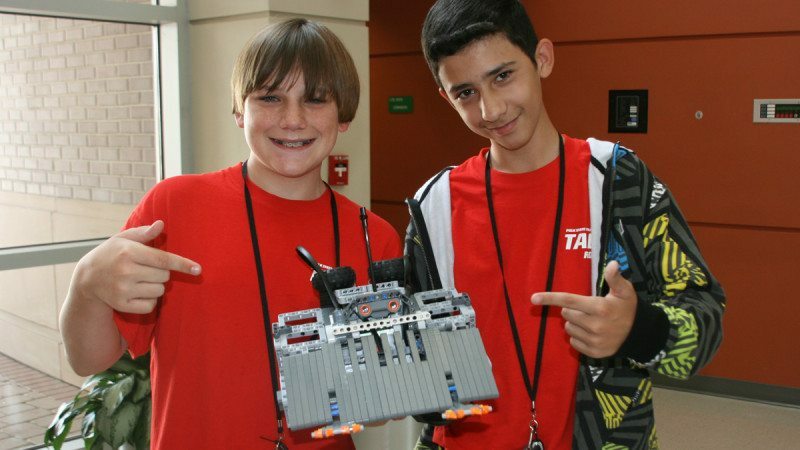 That eagerness to keep learning is common among TALON participants, said Michael Coker, who teaches technology and robotics and Lakeland Highlands Middle School and also the sumo instructor for TALON at Polk State Lakeland this year. “It’s fun to watch the students try different ways of building and programming their robots and putting prototypes together. We teach them to use trial and error and prototyping,” he said. TALON is also an excellent way of teaching interpersonal skills, particularly collaboration, Coker said. “The kids develop the ability to work together. You can’t do any of this without your teammate,” he said. The middle-school portion of TALON is called Eaglebots and uses LEGO robotics; the high school portion is Technobots, which uses VEX robots. Sponsors for this year’s TALON included AT&T and Boyer Building Corporation. Field trip hosts included Winter Haven Hospital, WellDyneRx and the College’s Engineering Technology Program. TALON is just one of several summer programs for children the College is offering this year. 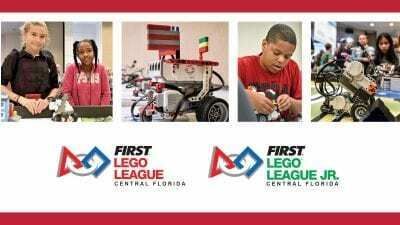 Others include Kids at College, Scholarobotics Academy, a camp in Network Virtualization, and athletics camps in baseball, basketball and volleyball.